If some of the additional security devices mentioned above are considered necessary, the Responsible Person must ensure that satisfactory management procedures are in place to ensure that the devices will not remain in place when the premises are occupied. As this process is placing a large responsibility on the person opening up a building as well as the Responsible Person, better solutions have been developed by fire exit hardware suppliers. Push or panic bars go back to the early twentieth century, as the result of a number of serious fires in places of public entertainment. In 1934, the recommendations of the Home Office in the introduction to its “Manual of Safety Requirements in Theatres and Other Places of Public Entertainment” were based on the lessons from nine disasters at home and abroad. Panic bars are specifically designed for use by members of the public who are unfamiliar with a building and who might panic if they suddenly have to evacuate the premises. Panic bars are very effective where large numbers of people are attempting to travel at speed through a fire exit as minimal pressure on the bar releases the locking mechanism, which can be a latch and / or vertical bolts. Push bars should carry an appropriate sign, i.e. ‘Push to open’, and should only be fitted to doors that open outwards. 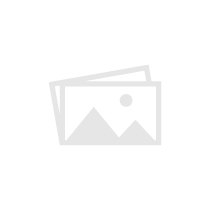 They are suitable for both single leaf and double leaf, rebated / non-rebated doors. Where access from the outside is required, external access devices can be fitted to enable authorized access through the door(s) under normal circumstances. Push pads are similar to push bars but feature a small pad as opposed to a horizontal bar. They are designed for single doors and should only be used where a panic situation is unlikely to arise in an emergency evacuation scenario, e.g. by members of staff familiar with the building and not members of the general public. This type of device should also be accompanied by an additional sign adjacent to the push pad indicating the method of operation. External access devices can also be fitted to allow an authorised override from outside the building. The Redlam emergency bolt (sometimes incorrectly called Redlam panic bolt) is an economical solution for turning an external door into an emergency exit. Please note that the bolt is NOT suitable for public areas! It should only be used where an emergency exit is used by staff. Designed for single doors, only. Breaking the tube results in the bolt sliding back automatically and unlocking the door. Redlam bolts were originally secured in the closed position using a glass tube, but now frangible ceramic tubes with spares are available. They are designed for emergency doors which are not in normal every day use and should only be opened for maintenance and testing. the physical breaking of the tube discourages misuse of exit doors for example to smoke outside. The Kingpin emergency bolt is similar to the Redlam bolt; when the handle is pulled, the Kingpin breaks into two pieces, allowing the spring-loaded bolt to retract and thus release the door. 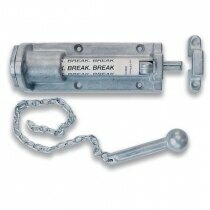 Both of the broken pieces remain attached to the bolt, thus eliminating any risk of injury or contamination. Other Types of Exits with Alternative Exit Control Systems. While the above mentioned panic and emergency exit solutions are sufficient for the vast majority of buildings, some specialist areas remain, such as high security buildings etc. The following systems describe a range of security locking mechanisms which can be integrated into a fire exit strategy. A maglock is a large electromagnet, usually fitted to the head of the doorframe, with a corresponding metal plate fitted to the face of door. 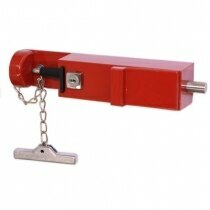 The maglock holds the door shut using the electromagnetic attraction (pull) between the magnet and the plate. This typically provides a holding force in the region of 3 to 5kN. Maglocks are always fail-unlocked in operation, meaning the door will be released if the power supply is interrupted. A shearmag is similar to a maglock in that it relies on the attraction between an electromagnet and a plate on the edge of the door to lock. However, in this case the plate has a number of protruding metal pins on the surface, with matching recesses on the face of the magnet. When the door is locked the electromagnet pulls the plate onto the face of the magnet. In this position the holding strength is then provided by the metal pins which are held within the recesses of the magnet. This provides much greater holding force than a conventional maglock, typically in the order of 7kN and upwards depending on size and type. Shearmags are always fail-unlocked in operation. An electric strike works in conjunction with a conventional mechanical lockcase to retain the latch or deadbolt in the striking plate and then release it on demand. Electric strikes are available to work with either latches or deadlocks, but the basic operation is similar, in that the bolt is held behind a moveable pivot, which is electrically released. Once released, pushing/pulling on the door causes the pivot to swing out of the way, allowing the door to open. Electric strikes are available in a wide variety of types with holding forces ranging from 3kN to 10kN plus. Electric strikes are available with both fail-locked and fail-unlocked mechanisms. A solenoid latch has a similar operation to an electric strike, but in this case it is achieved by the double action latch being freed to move back into the lockcase. When the lock is released, the door can simply be pushed/pulled open. Typically, these locks only have the option for a key cylinder to provide mechanical override, restricting their use on escape routes. These locks typically have a holding force in the region of 5kN and are usually available either fail locked or unlocked, but this can depend on the manufacturer. These operate like a conventional mechanical latch lock, but with the ability for either one or both handles to be electrically disabled. When an open signal is sent to the lock, the controlled handle is then able to retract the bolts and the door can be opened. Models are available with either one or both handles controlled. The models in which only the handle on the insecure side is disabled are suitable for escape routes and any area where there is free exit. 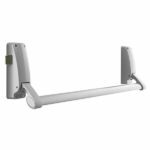 Models where both internal and external handles are disabled are suitable for areas where access is restricted in both directions. Solenoid handle locks typically have a holding force in the range of 7-10kN and are available with either fail locked or fail unlocked operation. Motorised locks offer a high level of physical security as they rely on a motor controlled bolt for locking. To unlock, a signal is sent to the lock that pulls the bolt into the lock case, allowing the door to be opened. Due to the time taken for the motor to pull the bolt back and to re-lock, these locks are not usually suited to very high usage areas. Typically, motor locks will have a holding force of 10kN plus. Unusually motor locks are neither fail locked or fail unlocked as (for the majority of these locks) with no power to the lock, the bolt will stay in whatever position it is currently in, whether locked or unlocked. Methods for gaining egress from the secure side of the door. Simple ‘Press to exit’ button. Green break glass override device. Electromagnetic devices should have a manual override. The locks should release on a power failure. The locks should release on operation of the fire alarm system. Suitable emergency disconnection arrangements should be provided at each locked door on the exit route. These will normally be in the form of a break glass unit positioned adjacent to the door. The fire alarm release may be by direct input from the fire alarm system interface or via the fire alarm interfacing with the security systems software at a central location. All break glass units associated with egress systems for emergency use must be green in colour. In addition, an appropriate sign, e.g. ‘Break glass to open door’, must be placed adjacent to the green release boxes. These signs must have 20 mm high lettering indicating Break glass to open door. Because there are so many combinations and differing situations it is impossible to give definitive advice and each door must be considered separately and the most suitable solution decided upon. Surface barcodes: similar to supermarket produce ID labels. To prevent un-authorised use of a fire exit, a number of fire exit door security alarms are available. ‘Stop’ alarms, for example, are triggered if the exit door is opened, thus allowing for any unauthorised use of the exit door to be investigated immediately. They can be stand-alone devices or an integral part of the door furniture. If you require general information go to Door and Hardware Federation. If you require more information about Access and Entry Control Systems go to British Security Industry Association.